Photo by Peter Bennets, courtesy of Grimshaw Studio. The Honestone Team recently completed an architectural flooring project for a headquarters for an Architectural Firm. 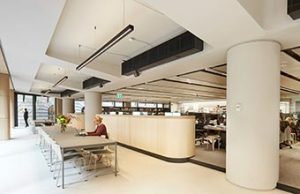 Honestone worked together with Grimshaw Architects, a global architectural firm, to provide polished concrete flooring to their new building in Charter Hall Building on 333 George St., Sydney. The goal was to install a seamless polished concrete floor for their entry lift lobby, main office walkways and break out areas. Grimshaw Architects had nothing but praise for our expertise in polished concrete overlay, our flexibility, and adaptability, as well as our work ethic. As part of the planning stage, we conducted a site inspection. The survey revealed that the base slab was in very poor condition. Using the base build slab was just not possible. It suffered from patching, infills, significant deflections in floor levelness and height issues with lift thresholds and adjacent finished floors. 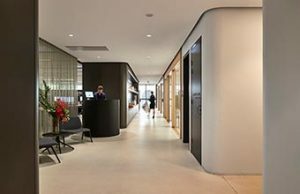 The Grimshaw team approached Honestone for our specialty in floor preparation and installation of thin set polished concrete and terrazzo polishable overlays. They needed concrete specialists to help them materialize their vision for their new office. They needed polished concrete experts who knew the product well enough to help them achieve their goal. 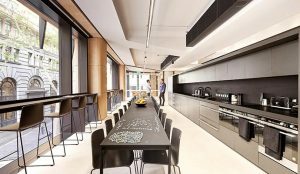 The Grimshaw fit out was project managed in-house by Associate Principal Jeff Morgan whom I met within the offices at that time. I was able to explain to Jeff the different options and individual product characteristics. I was also able to answer any technical enquiries the Grimshaw team had about the products. Our expertise in project staging and rectification of existing floors allowed Jeff to have a more informed flooring selection. Firstly, we explored different shades of concrete greys in various 3mm polished cement overlays. After several rounds of sampling, the Grimshaw team finally specified a 6mm polished cement floor in a white matte finish. The base build substrate required significant rectification to allow our 6mm topping to meet adjacent finishes such as lift thresholds; compliant fire exists and window façade shop fronts. The entire 300 plus sq. metres required some level of rectification from the Honestone team, grinding down high spots and building up low points. In the end we did the job in two stages: while the space was clear we came in and completed all the rectification works, then allowed the builder to continue with their fit out. Several months later, towards the end of the fit out, we came in and installed the final decorative overlay to the entire 300sqm over a week. This way, there was no chance of damage to the final floor finish. The resulting effect was a stunning and incredible open office space. It was a huge step above the initial concrete shell it once was. “They had total awareness of project requirements and met them. Given how critical the timing of their work was, I could not speak more highly of the flexibility of the Honestone team,” he added. So impressed was Mr. Morgan with our problem solving and thinset flooring options, and the limited tolerances for floor finishes throughout the multi-level building, that he also proposed our polishable overlays to building owners Charter Hall for L4 & 8 lift lobbies, which were subsequently installed several months later. Honestone specialises in polished concrete, concrete floor preparation, industrial flooring and seamless decorative flooring for various industries. We provide simple solutions to complex problems. And get the job done efficiently, with a quick turnaround. If a seamless polished concrete solution is what you need, feel free to reach out to us. Find out more about what we used in our Charter Hall Building project with Grimshaw Architects. Thin set: at only 3-6mm, polished cement flooring can now cover any sound concrete floor. combination. Visit our polished concrete colour selector page.